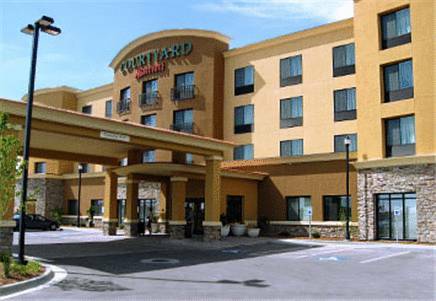 On your next trip to the Treasure Valley, stay at Boise's only full-service Courtyard by Marriott . Our rooms are made for business stays but equally comfortable for leisurely getaways. Each guest room includes a microwave, mini-refrigerator, and tea/coffee maker, or you can upgrade to a suite for extra space and a sofabed. Free high-speed WiFi is available throughout the property, including our spacious lobby furnished with private and sociable spaces for working and eating. After a full day, order drinks or hot meals at The Bistro, serving up made-to-order breakfast, dinner and Starbucks Coffee. Located in Meridian, ID, our Courtyard hotel is right between Boise and Nampa off I-84, offering easy access to the bars and restaurants in downtown Boise, concerts at Ford Idaho Center, and football games at Boise State University. Our hotel is only 10 minutes from the Boise Airport with complimentary roundtrip UBERs available upon request.